It is a supporting article for the main article "Runtime Error" where one of the solutions is disabling Script debugging feature in Internet Explorer. To read the main article, click on the link below. 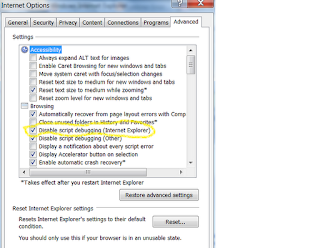 To enable/disable script debugging in Internet Explorer, follow the steps below. Check the "Disable Script Debugging" option under browsing. To delete saved passwords from Internet Explorer, follow the link below. If you are looking for a way to get rid of the message which prompts you to make IE as your default browser, click on the link below.